← It’s our 20th Anniversary–and you’re invited! Lie on blankets and cushions, or sit comfortably in a chair if you prefer, and let the soothing music wash over you. 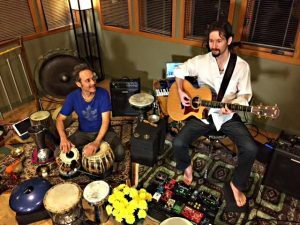 Musicians Sven Hansen and Bob Macko play a variety of instruments that specifically target the chakras (energy centers in the body representing the nexus of certain nerves and blood vessels), creating otherworldly soundscapes of hypnotic rhythm and gentle melody. These healing sounds refresh the mind, awaken the imagination and help create a meditative state of deep relaxation and healing within the body. We always say that this workshop is a great way to “hit the reset button” after a busy week and get ready for the weekend ahead. Register online, below (no Paypal account needed!) and scroll down to watch a sample of these talented sound healers performing one of their pieces! This entry was posted in Publication, Meditation and tagged meditation, sven hansen, sound healing, music, bob macko. Bookmark the permalink.